I can't even...how is this book so awesome? I am boggled by the awesomeness. I knew this book would be good, fantastic even. But I didn’t think I would love it THIS much. I’m saying it up front; this was one of my favourite books I’ve read this year. It was so deliciously twisted. I loved every vengeful page of it. I think the best word to describe this book is wicked. Wicked plot, wicked revenge and wicked characters in the very best way. Kat is an out-spoken, in-your-face character that doesn’t take anything negative without giving some in return. And I loved that about her. She is a bad girl that has every right to be that way, and every reason to seek revenge. She had a softer side behind all the bravado, a side that had been damaged and hurt by those around her. It was really interesting to see the contrast! Lillia I had mixed feelings about. Sometimes I just wanted to shake her, and others just give her a hug. I loved how protective she was of her sister, but I also wanted her to stand up for herself. Mary was such a sweet girl, with such a tragic past. I was livid about how she was treated, and wanted her tormentors to pay for what they had done. And those tormentors? Well, they were some nasty characters. Reeve, the egotistical, popular jock got under my skin from his first words. This was a guy who needed to be put in check, and these gals were exactly the ones to do it. Then there was, ugh, Rennie. I completely understand these girls wanting to get revenge on this vile girl. She was entitled, cruel, and vicious sitting high up on her pedestal. In short: she was the epitome of a mean girl. And she had a fall coming to her. I actually loved the plot of this book. Three girls getting revenge on those who’ve wronged them? That is the start of a fantastic story. I felt almost giddy with anticipation when reading this book. I knew it was leading up to something huge, something bad, and I was dying to know what it would be. It was odd how physical my reaction was to this book. I flitted between laughter, complete anger (which involved shaking the book), shock, and excitement. I was bouncing in place at some points! This book was a complete guilty pleasure, and one I can’t wait to read again and again. 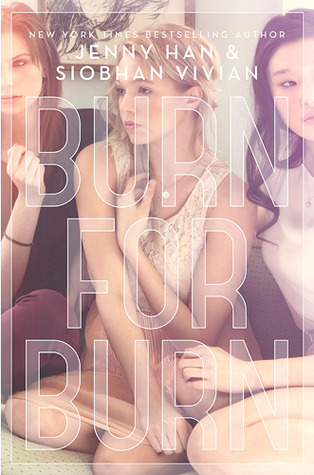 Revenge mixed with wicked gals and a suspenseful plot: that’s what Burn for Burn is. Everyone’s had those vengeful thoughts, and this book speaks straight to them. I loved it, and I think you will too. P.S. I want to say a very big THANK YOU to Liz from Midnight Bloom Reads for getting me a signed copy of Burn for Burn and a signed tour poster! This sounds oddly familiar haha. I've heard of this book but I've never really read what it was about. It sounds like something I would like.